Not Just Another Mother Blogger! : I Am An Influenster! I am considered to be outspoken about what I like and don't like, and I don't mind telling people my opinions. While surfing about one day, I found this website, Influenster. I was intrigued. I took a few surveys on my lifestyle, what I read, my television viewing habits, etc. Nothing too invasive or weird. I've done the survey websites before, the ones that are supposed to pay you to answer questions about various topics, and I have found most of them to be scams of some sort. They ask you the questions and then say that you don't fit the profile so they don't have to pay you, or something similar. I really don't have the time for that stuff. Influenster seemed different. I joined up. And then I got busy and forgot about it, because lately I have the attention span of a gnat. Until I got an email from Influenster, telling me that they were sending me a VoxBox. Ooooh!!!! Ever since I was a kid, I have loved getting packages in the mail. It's like Christmas, at least for a couple of minutes. We usually only check the mail once a week, but I was up there every day until my VoxBox arrived. Influenster sent me a box of free items so that I might review them. I could hardly wait until I got in the house to open the VoxBox. What was in my VoxBox? These are a few of the items I got! 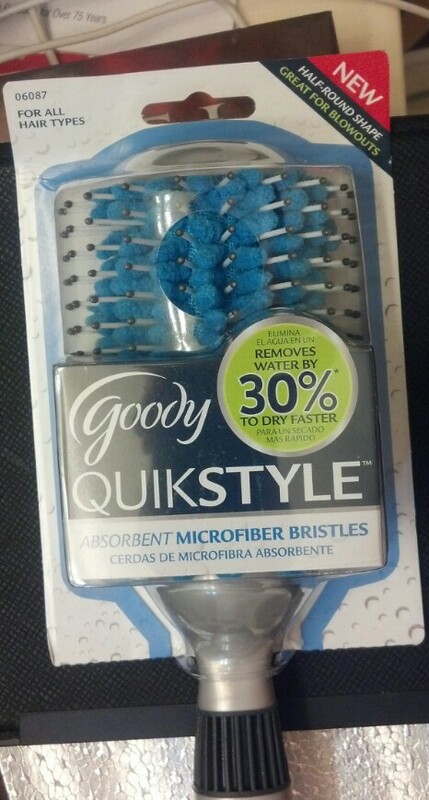 The Goody QuikStyle Brush is a brush which has "super absorbent microfiber bristles" which removes water from your hair while you use it. This brush is a time saver! I had seen this product in a store earlier in the month, and had planned to buy one on my next visit, so I was very happy to have this brush in my VoxBox. I am happy to say that the brush was a success. I first tried styling my hair with the brush; my blow drying time was shorter than usual. How do I know that? I timed it. I imagine that people who have long hair would prefer to use this brush, as long hair takes awhile to dry. I did notice a little bit of static in my hair afterwards, but I think that might have been for reasons other than my use of this brush(winter cold and heat seem to dry everything out!). I also let my hair air dry, and used the brush to see if the drying time was shorter as well--and it was. I am not sure whether the brush absorbs hair products, such as leave-in conditioners, and so I would not apply those items initially. I will buy this brush again. 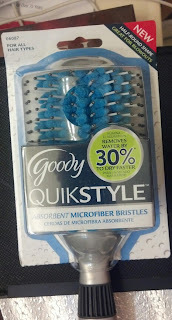 Goody is a great company; I've bought a number of Goody hair products over the years, and I love this brush! 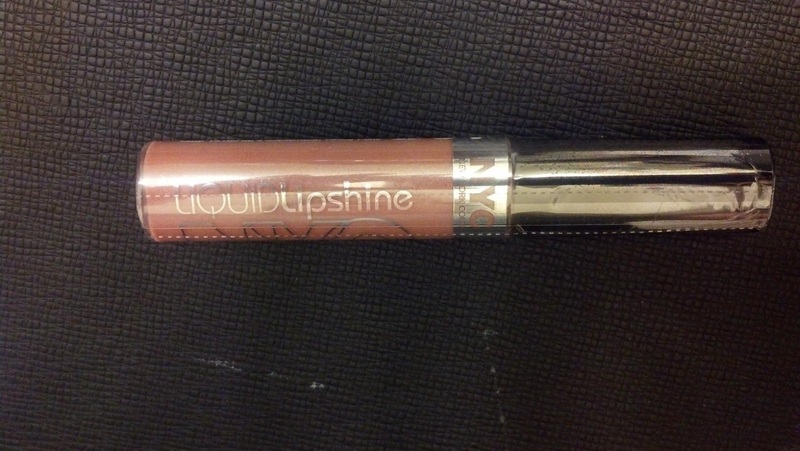 NYC New York Color Liquid Lipshine is a lip gloss that contains Vitamin E to help with moisture. The pigments are reported to "create a 3-D gloss effect"; I really am not sure what that is supposed to look like, or how one would measure such an effect. However, I am sure that it is lovely. 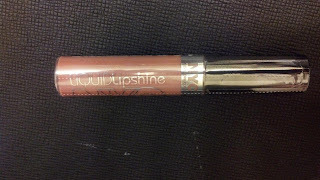 This particular NYC New York Color Liquid Lipshine smelled pretty marvelous, like brown sugar, or maybe caramel. The color was a neutral shade, and did not make me look washed out or odd. This lipshine was supposed to be "non-sticky", but it seemed sticky to me upon application. It also did not seem to last very long, so I had to apply it several times during the day. I liked this product. I am not sure that I would purchase it again, but I would probably recommend it to my friends who wear lipshine. When I was a girl, press-on nails were all the rage. These were colored fake nails that could be placed on top of your own nails. How the times have changed, and in a good way, at least when it comes to press on nails. Kiss Nail Dress offers the "ultimate nail fashion". All I had to do was peel these stickers and apply them to my own nails. This took a very short time and was very simple, two of the main things I look for in my beauty routine. I was not sure about the style I was sent, which featured "three-dimensional" jeweled designs. I prefer a less ostentatious look to my hands. However, the design has sort of grown on me. I did not like the unpleasant smell of the nails as I applied them, but that seemed to fade after the second day. The nails survived showering, washing dishes, and other household tasks, except that the 3-D jewels at the tips of my nails did not all remain attached. Removal of the nails was simple: just peel them off. 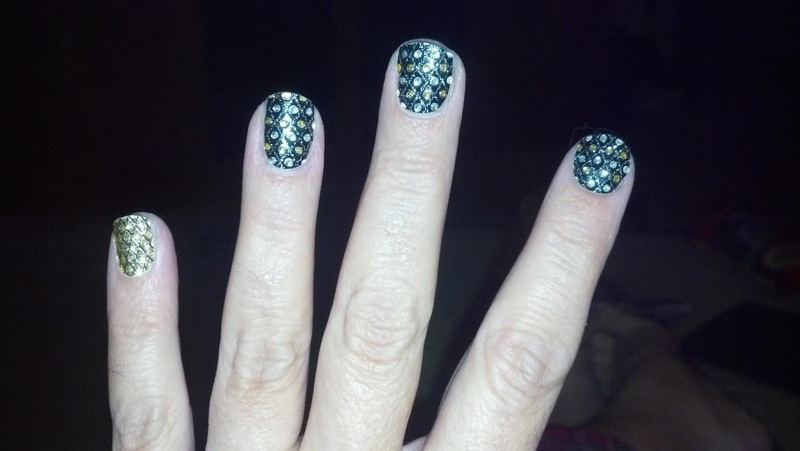 I did not see any damage to my nails as a result of wearing the Kiss Nail Dress, as would be the case with acrylic or gel nails. The Kiss Nail Dress is supposed to last for up to a week; so far it's been five days and they still look pretty darn nice! I would buy this product again, because occasionally I like to pretty up my hands. With the Nail Dress, I can look fancy without the commitment! As a working mom, I often find myself rushing out of the house without having time for breakfast. Then I arrive at work hungry, which leads to general grumpiness and bad decision-making. This package of Quaker Real Medleys Oatmeal+ can be carried in my purse or briefcase. All I have to do is add a little water and heat it, and breakfast is served. I think that this was my favorite item in my VoxBox. In fact, I went right out and bought some more, which I plan on taking to work with me. This oatmeal was delicious and filling, and that is exactly what I want in a breakfast. I wish that there was a brown sugar-cinnamon version of this cereal, because that was my all-time favorite when I was a kid. I loved my VoxBox, and I am glad that I was chosen to receive one. Overall, it was a positive experience for a geek like me!